Lately, I’ve been having a hard time falling asleep. Fortunately, this doesn’t happen every night — about once a week, I toss and turn just unable to sleep. Once I recognize that I won’t sleep right away, I head to the living room and camp out on the futon because I don’t want my tossing and turning (and snoring) waking up Charlie. Sometimes, I can read for hours on my phone, and other times, I watch TV and cuddle with a cat who decides I’m better than a sleeping Charlie. Any idea on what causes insomnia? I don’t. I’m not stressed. I’m not really worried about anything except finding a new job. I will admit I lack some motivation. Now that I have some free time, I can’t bring myself to work on any projects. Project A: make a hobo sack or easy drawstring tote using old T-shirts and scrub pants. Project B: finally work on my writing because I have some brilliant ideas (well, I think the ideas are brilliant). Project C: turn an old T-shirt into a tank in about five easy steps. 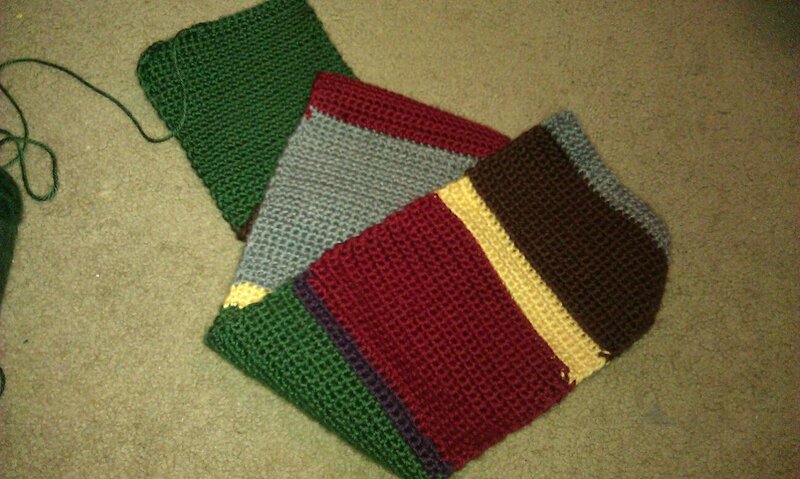 Project D: finish my own Dr. Who scarf. Project E: make a cute little tote using a fabric placemat. I even organized my hobby room to have better access to all of my projects. Thanks to boxing all of my craft stuff into banker boxes, I can easily hop from one project to another. I love it! Now, I just need some motivation to complete some projects. 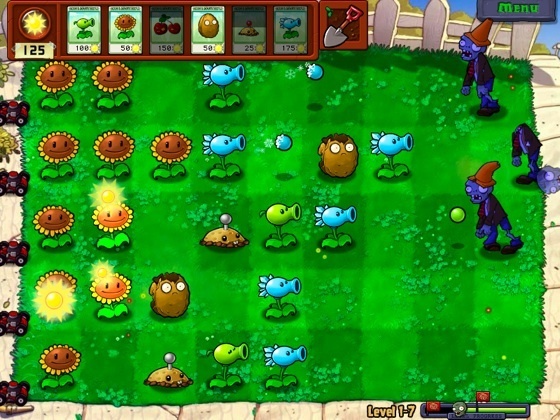 Instead I turn to playing “Plants vs. Zombies” for hours — a game that I’ve played through at least half a dozen times. The game just easily draws me into its evil web of sucking my time. Or I wait impatiently for my opponents to take their turn in “Words with Friends.” Oddly enough, I don’t turn to TV to waste my time. I tune in at night for favorite shows, but I don’t watch too much during the day — small victory for me. What I really need is a small lamp by the futon. For those sleepless nights, I can easily and quietly turn on the lamp and work on something quiet, such as my Dr. Who scarf or read a book, which by the way I’m reading the final book in “The Hunger Games” series. The books are fantastic, and I cannot wait for the movie which open March 23. CANNOT. WAIT. I don’t want the bright light of the living room disturbing Charlie, so a small lamp near the futon would be perfect. Although I’m not really stressed or worried about anything, I do think about stuff during my sleepless nights. Figuring out my lack of motivation to start or complete projects. Thinking of story ideas and situations. Reassuring myself that I am not lazy or incompetent person. Making a mental list of the things I need to do for the next day. Thinking which errands or chores on the mental list can wait for the following day. One night, I thumbed through all the photos on my phone and deleted any unnecessary or old pictures. Sometimes I take a sleep aid medication to help me because I don’t want to be that person who sleeps until noon. As much as I love sleeping in, I think 10 a.m. is my limit. I don’t take the sleep aid medication on a nightly basis, just every now and then when I realize I’m not tired around bedtime. Even though the medication says “not habit forming” on the box, I don’t trust that recommendation and limit my usage of the medication. I really don’t want to take sleep aid medication every night. Well, hopefully, during my next sleepless night, I can accomplish something. Maybe. I think deleting old and unnecessary photos from my phone is an accomplishment even if I did it in the middle of the night.